4.3 70th anniversary commemoration series: Why did she have to bind her face in white cotton fabric? This is part of a series of articles released by the Jeju April 3 70th Anniversary Commemoration Project Committee (translated by Jia Min Tan) in commemoration of the 70th anniversary of the 4.3 Massacre. This article is about the story of Jin Ah-yeong, who, after being shot in the chin during the 4.3 conflict, spent the rest of her life covering her face with a cotton cloth. As her small face was always bound in a white cotton fabric, she was unable to talk or eat anything properly. This meant that she was always emaciated and sickly. However, it hadn’t always been like this for Grandmother Jin. If it had not been for one day more than seventy years ago, she might have lived a more ordinary life. Jin Ah-yeong was a young lady who lived in a quiet, peaceful village. However, the 4.3 incident started in 1948 and in January, 1949 she was shot in front of her house in Hangyeong-myeon, Banpo-ri. The police had mistaken her to be a member of the armed forces. She collapsed after taking a hit to her chin. She narrowly escaped death but lost a part of her face. From then on, she could not talk or eat properly. She was only 35. To cover the scar left on her face by the bullet, Grandmother Jin bound her face in cloth for the rest of her life. She never let anyone see her eat and she always locked her door securely when she left her house, even if it was just going next door, because of a fear that something might happen. The bullet wound healed with time, but the wound inside her followed her for the rest of her life. All that was left in her life was cotton cloths, digestant drugs, and painkillers. Grandmother Jin made ends meet doing odd jobs. Her life became even lonelier after her sister passed away. She always looked as if she wanted to say something, but nobody could understand her. Tortured by malnutrition, digestive disorder, and psychological trauma throughout the rest of her life, Grandmother Jin passed away quietly in 2004 at the age of 90 in a hospital in Hallim-eup. Her memory still remains stuck on that day seventy years ago, and the words she wanted to say are now lost. Did her life, so filled with agony, have to end just like this? In 2008, a group of people proposing to remember the life of Grandmother Jin came forward. After hearing her story, The Jeju Citizens' Self-Government Solidarity Group (a non-profit civil organisation) started a fundraiser in order to preserve the house that she had lived in. Since the founding of the Committee for the Preservation of Grandmother Jin A-young’s Residence, many people came forward to volunteer and donate items like paint, wallpaper, and turf. The once deserted house was now bustling again. Jeong Min-gu, the chairperson of the Committee, expressed that there is a higher value to the preservation of Granny Jin’s residence. 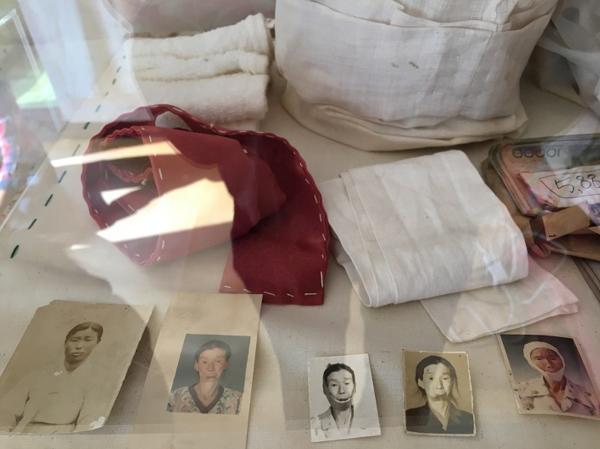 The house retains the way it was when Grandmother Jin was still alive, and the cotton cloths and other items that she used are exhibited, along with an old television that plays the documentary about her life. The situation is so bad that we can’t even replace the broken TV. Jeong Min-gu emphasized hopes that Grandmother Jin’s residence could become a space to remember that fateful day from seventy years ago.